A national treasure in France, Gad Elmaleh proves that his humor extends beyond the provenance of baguettes and pastries as he delves into the tricky terrain of the English language, joining other immigrant pioneers in search of The American Dream. On the surface, it’s hard enough to imagine a Moroccan-born Parisian comedian, but then you learn he’s been inducted into the Order of Arts and Letters by France’s Minister of Culture as well as Knighted into the National Order of Quebec? Meet Gad Elmaleh in his first-ever English speaking comedy special, Gad Elmaleh: American Dream. He’s a handsome, expressive guy with bendy legs and perfect frozen expressions of bewilderment, especially when musing on the cultural differences between France and America, in particular that elusive creature known as The American Dream. On one hand, he acknowledges the cynical rhetoric with which the abstract theme has been manipulated over generations, while on the other he sincerely counts himself in on the whole package, from an immigrant subscriber’s perspective. Here in the U.S. we have a hard time thinking beyond our own cultural borders, and that includes our stereotyped expectations when it comes to stand-up comedy. That’s why it’s so important to expose our minds to voices other than the (now) archetypal Jewish humor of the Northeast, or the Midwestern Americana or the Yankee Irish sensibilities of our most famous purveyors of laughter. (And of course these are just over-simplified classifications themselves). Funny is funny, and it’s refreshing to see so many diverse voices, accents, and cultural nuances shaping a new, global lexicon of Humor. As Gad Elmaleh would probably say himself, “Vive La Difference!” . . . and he’d know just where to put the stress. 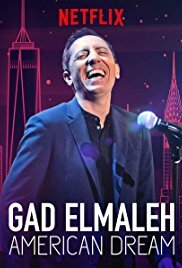 Gad Elmaleh: American Dream is presently streaming on Netflix. Norma’s Streaming Picks is proud to announce squatters’ rights on a fantastic site for Baby Boomers, Midcentury/Modern as well as right here at home. I invite you to go there for more great content!